Despite being my favorite cakes, entremets are very time consuming. Only someone who’s ever made one knows how much time all these layers involve, how much energy you put into a cake, how much passion it takes to make it through. So no surprise that you barely find entremet recipes out there. Not only that the cake itself is time consuming, but writing the recipe itself takes just as much time and there are only a bunch of people willing to go through the recipe from top to bottom, read it carefully and understand its complexity. Bottom line is it takes a lot of dedication and love for desserts to adventure into this world. 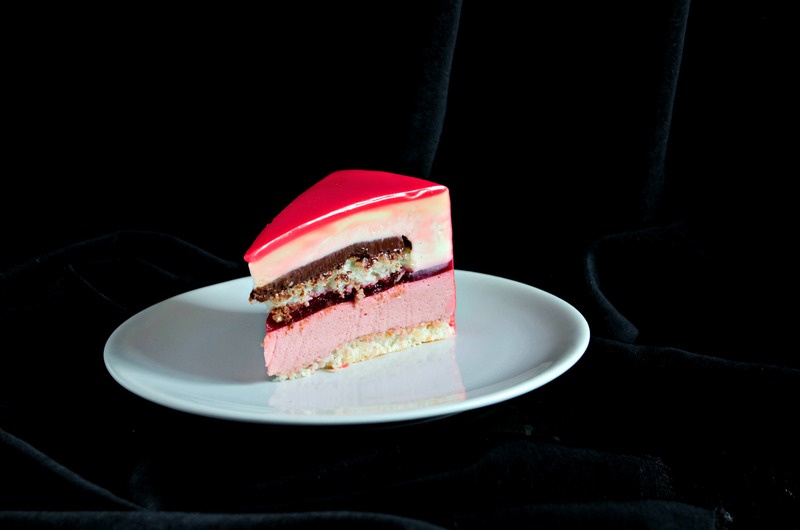 But I dare you to do it.. once you make an entremet, you never see desserts the same way again. Words wouldn’t be enough to explain why and how much I love this type of cakes. All those layers, the time spent making it, decorating it, even slicing into it is pure joy for me and I’m not exaggerating at all! This cake was born after seeing a post on Facebook from one of my all time favorite pastry chefs, Antonio Bachour. It was a bar and the description said, among others, rose and hibiscus. I was intrigued, I’ve never really worked with these two flavors before and although I was familiar with the intense aroma of rose, never ever tasted hibiscus. So I went online and ordered both dried rose buds and hibiscus. 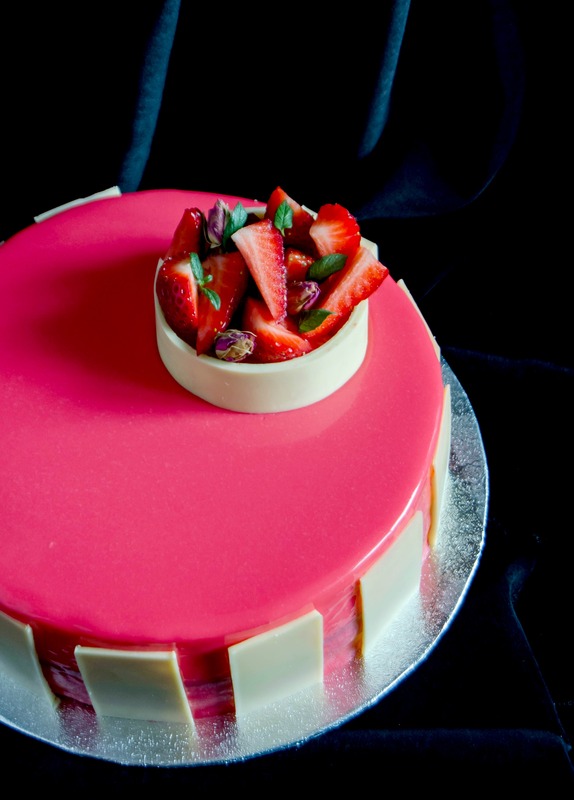 A few days later I was “armed” with the ingredients and a sketch and this raspberry rose entremet was born. The one thing that I don’t quite like is the color of the glaze. Depending on your desktop, it may look either pink or fuchsia, but in reality it’s a soft pink, not at all disturbing. I was going for red, but after adding the food coloring, I realized it would take way too much coloring to reach a beautiful red color and since that thought was not at all appealing, I gave up on red and left it pink. 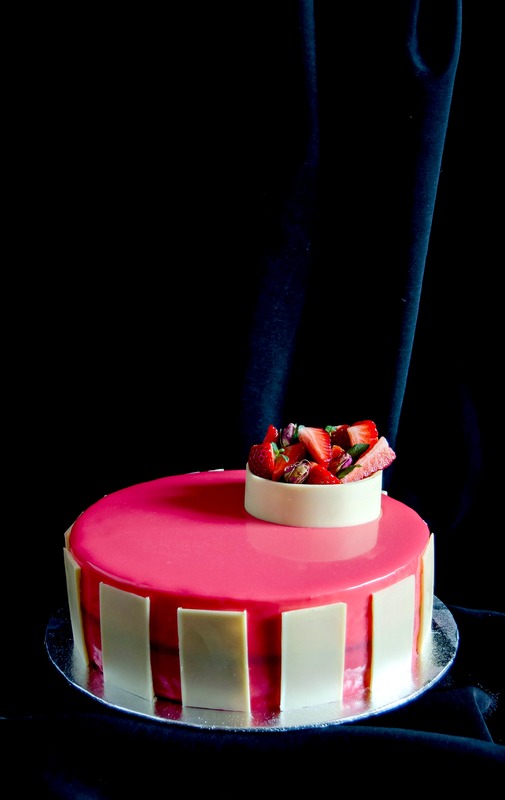 The layers of the cake are (from bottom to top): coconut dacquoise, raspberry rose bavarois, raspberry hibiscus gelee, coconut dacquoise, raspberry chocolate ganache, white chocolate yogurt mousse, vanilla white chocolate ganache, pink glaze – a total of 7 layers. It’s my first entremet of 2015 and hopefully many more will come after! Mix the almond flour, powdered sugar, coconut, freeze dried raspberries and flour in a bowl. Place aside. Combine the egg whites with a pinch of salt and mix until fluffy. Add 60g of sugar, mixing all the time, until stiff and glossy. Fold in the flour mixture in 3-4 additions then spoon the batter into a piping bag and pipe 2 rounds of batter onto two baking pans lined with parchment paper. One of the rounds needs to be smaller than the other. Mine were 24 and 18cm diameter. Bake the dacquoise in the preheated oven at 350F - 180C for 15-20 minutes or until golden brown and it you press the top, it springs back. Allow the cakes to cool down completely then place the larger sponge in a cake ring. Place aside. Bloom the gelatin in water for 10 minutes. Combine the raspberries, lemon juice, rose tea and sugar in a saucepan and cook for 10 minutesover low heat. Pass the mixture through a fine sieve to remove the seeds and place aside. Combine the milk and powdered sugar (1) in a heavy saucepan and place over low heat. Bring to the boiling point. Mix the egg yolks with powdered sugar (2) in a bowl until creamy. Pour the hot milk over the egg yolks, mixing all the time then transfer the mixture into the saucepan and cook over low heat until it begins to thicken. Remove from heat and stir in the raspberry puree and melted gelatin. Allow the mixture to come to room temperature then fold in the whipped cream. Pour the bavarois over the first layer of dacquoise and freeze until the next layer is ready. Infuse the hot water and hibiscus for 10 minutes. Combine the raspberries and sugar in a saucepan and bring to a boil over low heat. Cook for 5 minutes then remove from heat and pass the pruee through fine sieve. Strain the hibiscus through a sieve, squeezing out every drop of liquid. Mix the hibiscus infusion with the raspberry puree then add the melted gelatin. Allow the gelee to come to room temperature then pour it over the raspberry rose bavarois. Refrigerate until set then place the remaining disc of coconut dacquoise over the gelee. Mix the raspberries with sugar in a saucepan and cook for 5 minutes until softened. Pass the raspberries through a fine sieve. Mix the raspberry puree with butter while still warm. Combine the raspberry puree and heavy cream in a saucepan and bring it to the boiling point. Remove from heat and stir in the chocolate. Mix until melted. Pour the chocolate into a small pan lined with plastic wrap. Mine had 18cm to match the second dacquoise layer. Freeze the ganache until set then carefully place it over the coconut dacquoise. Bloom the gelatin in cold water for 10 minutes. Combine the yogurt with melted white chocolate and mix well. Add the vanilla extract and melted gelatin. Let the mixture cool if needed then fold in the heavy cream. Pour this mousse over the raspberry ganache and refrigerate until set. Combine the heavy cream and vanilla bean in a saucepan and bring to the boiling point. Remove from heat and let it infuse for 15 minutes. Remove the vanilla bean and bring the cream to the boiling point again. Remove from heat and stir in the butter and chocolate. Mix until melted and smooth then pour the ganache over the yogurt mousse. The next day, remove the cake from the ring and place it in the freezer for 1-2 hours before glazing. The colder the cake is, the smoother the glaze layer. Melt the white chocolate over a hot water bath or in the microwave. Bring the cream to the boiling point then pour it over the melted white chocolate. Mix until smooth. Combine the glucose and nappage in a saucepan and bring to the boiling point. Remove from heat and pour this mixture over the white chocolate. Mix well until smooth then add red or pink food coloring. Whisk until smooth then allow the glaze to cool before use. Remove the cake from the freezer and place it on a wire rack. Evely pour the glaze over the cake. You may have to repeat this step twice in order to obtain a good coverage. Bloom the gelatin with cold water for 10 minutes. Combine the water, sugar and lemon juice in a saucepan. Remove from heat and stir in the gelatin. Mix well then allow the nappage to cool completely. It is best done the night before. Am citit toata reteta si modul de preparare :))) Marturisesc ca nu as avea timpul si rabdarea necesara pentru asa minunatie, desi arata ca o fantezie! Bravo, Olguta, esti one of the kind! I’m sooo glad I found your blog! You make fantastic cakes and desserts and I really love your motto! Thank you, Orsi. My motto was born after having some tasteless desserts at a local bakery, desserts that simply didn’t stand out.. except through the fact that they lacked flavor and were overly sweet. Yes, most pastry shops offer that.. fairly cheap desserts that taste like nothing or too much sugar in the best case scenario. Thank you for stopping by, it’s lovely to meet you. Hello, Stephani. Thank you for trusting my recipes. I’m so happy they turn out great and you loved them. Feel free to send me some pictures with your cakes if you have any. Hello! This is beautiful! Saw your post from the Blogher thread! You are right about entrements… they are time consuming, especially in a home kitchen, but oh-so worth it! Thank you! Yes, they are worth it. What a beautiful cake! Sounds so delicious. Yum! Just asking, when said in the recipe shredded coconut, is that the same with dehydrated shredded coconut. I live in the US and the most common coconut where iam which is in Mountain of Georgia is coconut flaked sweetened( moist and tender) and dehydrated shredded coconut. It’s dehydrated shredded coconut, sweetened or unsweetened. Thank you very much! Iam so excited to make this! But right now iam baking your carrot cake. Thanks again. Multumesc, Gio. Ma bucur enorm ca ti-a iesit si v-a placut. Hello from Texas! your recipes always look so fabulous; I made this entreme for mother’s day and it was beautiful and delicious. The recipe is so well written, thank you so much! That’s amazing, Juri. I’m so happy you liked it. Well done! This entremet took my breath away, the amount of work! You have done such a splendid job, and I am so glad to come across your beautiful blog :-). You got a follower in me! Thank you so much, Jehanne. Suna “delicios” tortul. E vreo șansă să il postezi și in romana? I’m so glad I found your blog. I start making Entremet and you are right, it’s very time consuming but it’s so elegant with a exquisite taste. So it’s well worth it. I have a question about glaze. How do you like the glaze in this recipe compare to popular recipe with condensed milk ? Is this glaze easy to work with ? Is the taste better ? I don’t like condensed milk so I try to find different recipe for glaze. Pe cand si o traducere in lb romana?